Former Windows head Steven Sinofsky was one of the most influential figures at Microsoft, suggested for the role of the future CEO by many until suddenly he quit the company for what was officially pictured as pursuing his own goals, but in reality it seems there was a clash with current chief executive Steve Ballmer. 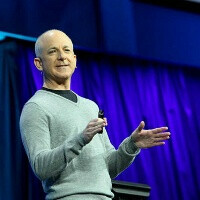 Nonetheless, it might have been a bit surprising to see tweets from Sinofsky - just months after his departure from Microsoft - coming from an iPhone. This was fertile ground for all kinds of theorizations and rushed conclusions, ranging from thoughts that Sinofsky has quickly jumped to Apple’s products after no longer being tied by Microsoft to a more sensible opinion that he is just using various products to evaluate them. “I have owned every iphone released (and every ipad and galaxy and kindle). It is far better to actually use a product day in and day out so before CES I started using it and will use it for a month or so. Just prior I was using my 920. So it turns out the reason is very mundane with Sinofsky changing devices quite often as he should actually. I wish I had that kind of money to switch phones whenever I want... Pfffft. He sounds a lil like Steve Wozniak. I also wish I had the money to do that...lol. Sinofsky knows better than any1 how good WP8 is, so he uses another phone now he is not obliged to use a WP. No way, he doesn't have anything to contribute to Android, just look at WP8. Apple seems to fond of the name 'Steve.' Or the other way around.